It was almost four years ago when we decided it was time to launch our online video blog, NewTeeVee. At the time, I wondered to myself how I could best understand the ongoing broadband-based video revolution in a way that would give me a window into the future – so I decided to do what was unthinkable at the time: I called Comcast and asked them to turn off my cable TV. And remember, these were the glory days of The Sopranos and Weeds, so it was a major sacrifice. Nevertheless, my broadband sources were telling me that bandwidth-to-the-home was on an upswing and was seeking a killer app — and that video was most likely it. Large media companies were demonizing devices like Slingbox and bemoaning YouTube. These were signs that the big shift was about to happen. So just like that, I became one of the earliest cord cutters. MLB.com and Willow.tv took care of my need to watch live baseball and cricket respectively. Hulu, which despite my own personal skepticism became my best friend when I was recovering from my sickness. Netflix (s NFLX), which brought streaming (and DVD rentals) into my life. iTunes Video Store, which allowed me to purchase new television shows when I wanted. We want to watch what we want, when we want, where we want, and discover the content how we want. His comments made perfect sense to me – just as mobile phones freed me up from thinking about communications as a static activity and turned calling and texting into part of my daily life, ever-present broadband (wireless or wired) would eventually make video part of my daily media consumption. In other words, my quixotic adventure is slowly becoming mainstream. According to NewTeeVee estimates, about 500,000 folks cut their basic cable subscription in the third quarter of 2010 alone. Are they all cord cutters? Not sure, but there are many who are. It is common for me to run into folks who tell me that they get their video-fix from Hulu, iTunes, Netflix and a handful of other services. Whether it is the onslaught of new services (HuluPlus), Netflix embedded in televisions and DVD players, briskly selling $99 AppleTV or growing interest in Roku and Boxee, these days cord cutters are a whole new demographic. Like me, they are foregoing their cable or satellite television subscriptions, and instead opting for broadband-delivered video, which they consume on their own terms, on devices of their own choosing and at a time of their convenience. Last month, NewTeeVee launched a new GigaOM TV video show, called — what else — Cord Cutters (You can follow the show via @cordcutters on Twitter and watch the two episodes we have released thus far). ESPN Leads the Way Over the Top, But Will Others Follow? Thanks for the video. Could you please offer them for download, because Videoâ€™s wont loadâ€¦ stuck at 45 seconds. Video’s wont load… stuck at 1 min. Could you please offer them for download? Or play them in something where you can see the progress of the buffering… or something. Am very interested but unable to appreciate. Thanks for the great post and comments. I, too, have been a cord-cutter since March 2007 when I moved out of my home for a major remodel. I put an HDTV antenna on the roof when I moved back in, kept my TiVO service and subscribed to Netflix. – watch TV, movies and other content from the Internet on my plasma TV using a castoff laptop as a media server. When you talk about cutting the cord, don’t forget the rich content available from broadcast HDTV. how does one cut the cord in the UK where to get live premier league soccer you have to get a full Sky Sports subscription for the games you want to see and the games you dont. Do you see Apple (or even ESPN who have a foothold in UK soccer) ever taking on this so you get PPV for each team/game as per itunes for music and video? Basically the Sky/Soccer UK model hasnt changed in 18 years – mereely teh contract and money gets bigger each time! Given that there are already many dubious (p2p) ways to watch streams of Premier League matches online, there will be increasing pressure to offer something along those lines. Then again, I can’t see Murdoch wanting to dilute the one thing that has made Sky such a powerful broadcaster! Still trying to figure out how to cut the cord & still watch sports on my 50in tv in HD. Can’t do it that I can see. ESPN3 is close but limited to pc & low quality. It is going to take a sports content producer to push this. Soccer has a great opty in the states to push this as (like me) soccer fans want to watch their team (Barcalona) when they play & access on the large screen in HD or small screen when on the go. Willing to pay $10-12/month for this access. Om, you and your staff have done a great job with NewTeeVee. Thank you for helping report on this very exciting trend. Om, with all due respect, the numbers you are quoting from the NTV post are misleading and only tell part of the story. On one hand NTV is very quick to talk about how many subscribers the cable companies lost, but then don’t tell the flip side of the story on the number of subscribers the phone and satellite companies picked up. The numbers were presented in a way to make a point, but didn’t tell the entire picture. I don’t disagree that the future of the TV business is going to change and the real question is going to be defining what “TV” really is. But the idea that online video and devices are replacing cable TV simply is not accurate. I keep seeing articles talking about devices, yet few ever mention how many have actually been sold and what the adoption rate is. Many talk about “expensive cable bills”, but don’t talk about what the average costs really are. Bloggers keep talking about how you can simply go online to get content, but don’t add up all the costs associated with it, based on the shows you want to watch. In my opinion, NTV’s content has gotten to the point now of where it is too focused on trying to convince the reader that cord-cutting is real and that now seems to be the theme of the site. My point is that I don’t think the success of this industry, which has been around for 15 years now, should be judge based on how many people “cut the cord”. A large portion of the industry is successful today and will only continue to grow in the future. We don’t need cord-cutters to justify the success or failure of the space. In nearly every case, online video is a compliment to other models, it’s not a replacement. Listen, they (cable companies) are doing well and they have to play their cards. My only comment is they donâ€™t know what they donâ€™t know. And I think I have all of the bruises of sort of playing out the same strength. We never thought anybody would cut the cord on telco, right? We have got 30% of our customers cutting the cord. Young people are pretty smart. Theyâ€™re not going to pay for something they donâ€™t have to pay for. So youâ€™ve got to watch the market, over the top there is going to be a pretty big issue for cable. With broadband + a handful of other services, the total price is still lower than what essentially you end up paying for cable every month. Sure, there are a lot of costs involved with cord cutting, but it is not like they all add-up to about $125 in cable fees that I end up paying. On the actual trend, well there is not single day which goes by when I don’t hear from someone or the other who are cutting the cord. And as to those switching from cable to satellite/phone, sure there are some who are going in that direction, but then there are some who are moving away from them as well. Anyway thanks for the comment and good to see you doing well. I agree in tone with Dan. I also agree that you’re clearly onto something, but please, please, please, write an an even keeled article on this issue. The older generation who run the cable business don’t take this site as seriously as they should because the valid counter points are not even breached here. I’m a young person working on launching a new network and though we recognize the emerging power of alternative platforms, we’d be crazy at this point to forgo a cable deal. A clarification of your numbers. $120 does not immediately equal only $40 savings. Our satellite/cable portion was the same, and was $65 either way. Phone $20, broadband $40. So, cutting the cord cut the bill by more than half. Dan, most consumers don’t pay $40 for cable. In fact, some reports have put the price of the average cable bill at around $75. You can buy a whole lot of iTunes episodes for that kind of money. Can anybody recommend a good article for potential cord-cutters (FAQ, 101, etc.)? 1. Must have good DSL or cable – minimum bandwidth 6Mbps, 10 would be better. 20+ even better. Shop around for best throughput/$$. – some tv shows (check itunes store to see if your fav shows are available for sale) for $0.99 per show SD and 1.99 or 2.99 for HD. Seasons passes vary up to $52 (Modern Family). – NetFlix streaming (sign up for $9 per month – stream as much as you want – lots of movies, tv shows available). 3. Your only other (real) choice is Google TV. You can buy it as a set-top box from Logitech (Revue) for $299 or bundled with a SONY blu-ray player ($399). 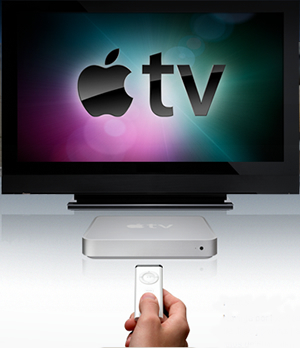 COnnects the same way as AppleTv to your network & TV. GoogleTv does all of the above + has a browser to offer (Chrome) that lets you go to any website on your tv. Recently several tv channels blocked GoogleTv from pulling free content from their sites (SD or HD) – expect such baffling protective behavior to continue. In a few years, either via YouTube or via their own Apps/Widgets, expect more tv channels to make content available for either option. Till then, it is not really a wholly satisfying experience but you *will* save money. If you already have DSL, this is no additional cost and a one time $99 or $299 expense vs. $50-100per month for conventional HD programming via Cable or Satellite. Win-win for everyone, if you want to cut the cord you have to look for something with features that don’t require cable. Google requires cable/satellite, Apple requires me to pay for everything I watch, both allow Netflix, thats pretty cool. I am watching WhiteHatt, http://www.whitehatt.com. after intermittently going without satellite/cable, i cut the cord for good a week ago and will try out Apple TV and Google TV on my 18Mbps pipe. Initial impressions on AppleTV: its not quite all the way there in a consumer friendly way but the writing on the wall is clearer than ever – there is no going back – there wont be a reason to. I will miss a few primetime shows (BigBangTheory) which are not on iTunes or HD-streamable just yet but that is a fair trade off for the 20odd subscriptions via YouTube that offer content not available on dish/cable. I want my content when I want it and where I want it and all in HD. Cable/dish are still peddling legacy ‘channels’ which are in the way of consuming content ‘my way’. Even netflix doesnt quite get it – their CustServ rep was confused when I asked him what is the monthly plan for ‘streaming only’ because I don’t want any DVDs from them. They will get there, as will Amazon V-o-D and Google, Apple, Facebook, Twitter, and new content creators/suppliers in this democratic model of media. Apps and podcasts (Google or Apple) offer the least frictionful way of getting original content from creators to consumers. Taking obstacles out of creator-to-consumer cycle will make big winners out of whoever gets it right. How does one become a cordcutter in the bay area where we’re limited to Comcast or ATT U-verse for high speed broadband. Am I missing something? For both, the triple-play offering is the logical move, esp. since most over 30 years in age would prefer to hang onto their landline. And what about HD content? I would love to be able to get rid of my DirecTV subscription, but where else do I get a similar number of HD programs? Don’t have a TV. Never did. Probably never will. This is a win-win-win model. Content creators can deal directly with their audience. Viewers finally have a menu along with the buffet option, which includes HD content. Advertisers get great targeting options and reap all the benefits of going digital (esp. as TV > Web integration continues to grow). As someone who has lived without cable for the past few years now, it all summed up nicely last night, as my wife and I finished watching the pilot to The Walking Dead. Seeing a great show doesn’t make either of us want to get cable anymore. It makes us look forward to giving the next episode (in HD) a shot via Amazon.